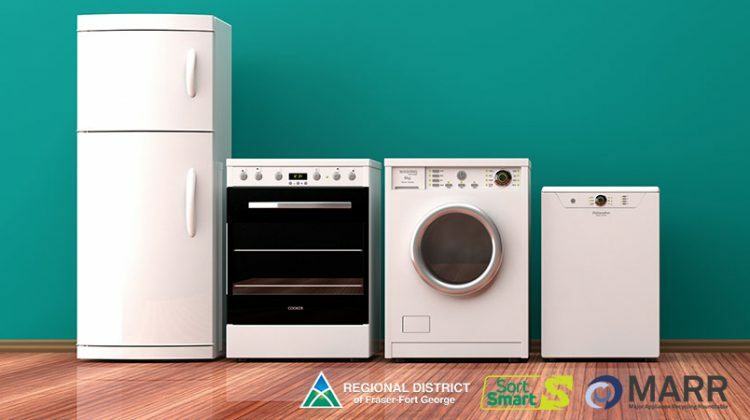 The Regional District of Fraser-Fort George is partnering with the Major Appliance Recycling Roundtable (MARR) stewardship program to offer a new waste reduction initiative! The Major Appliances Recycling Roundtable is a not-for-profit stewardship agency, created to implement and operate a stewardship plan for “end-of-life” major appliances in the province of BC, on behalf of the major appliance “producers” who are obligated under the BC Recycling Regulation. The MARR stewardship program received the approval of BC’s Ministry of Environment in 2012 and today is the ONLY approved stewardship plan for collecting and recycling major household appliances in the province. For home owners, one of the easiest ways to save money is to purchase energy efficient appliances. And with the new, comes the question of what to do with the old. Major appliances used for cooling or freezing purposes (refrigerators, freezers, dehumidifiers and air conditioners) contain refrigerants, which are bad for the environment and human health if not properly handled and disposed of. Even though most Ozone Depleting Substances (ODS) containing products are largely metal based, they must still be kept separate from the metal bins at applicable facilities, while non-ODS containing products must still go in the metal bins along with all other allowed metal. The Regional District’s partnership with MARR is a waste reduction initiative developed to increase awareness of recycling opportunities and reduce the amount of waste going to landfills by giving residents the opportunity to drop off their large appliances free of charge. With MARR, you no longer have to worry about what’s recyclable and what’s not. You just need to know WHICH facility to drop your large appliance off at! Residences within the Regional District can drop off their large appliances for FREE – including appliances that contain Ozone Depleting Substances (ODS), as well as washers, dryers, stoves and a variety of other approved appliances. All appliances must be clean and empty of food.